. St-Petersburg. 320 p. (Etnographica Petropolitana, I). ISBN 5-85803-111-0. Hardback. Number of printed copies - 1000 copies. Wholly in Russian. Preface. 7-9. Introduction. 11-19. Chapter I. Religious-magic sources of cult of birds of prey. 21-23. Cult of sun, fire, astral bodies. 23-26. 2. Cult of nature origin, fertility and productivity. 26-44. 3. Totemism. 44-61. 4. Animism. 61-69. 5. Shamanism. 69-75. 6. Islam. 75-89. Chapter II. Cult of birds of prey and social-economical aspect of falconry. 91-92. 1. Hunting rites. 92-111. 2. Social system, power, State. 111-150. 3. War and art of war. 150-161. 4. Economical (practical) aspect. 161-171. Chapter III. Cult of birds of prey and their folk classification. 173-175. 1. 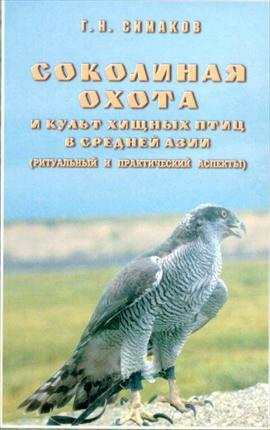 General principles of the classification of hunting birds of prey and personages of their higher level. 175-200. 2. Types (species) of hunting falcons. 200-205. 3. Types of hunting hawks. 205-208. 4. Types of hunting Golden Eagles. 208-224. 4. Kyraan (kyran). 224-229. Chapter IV. 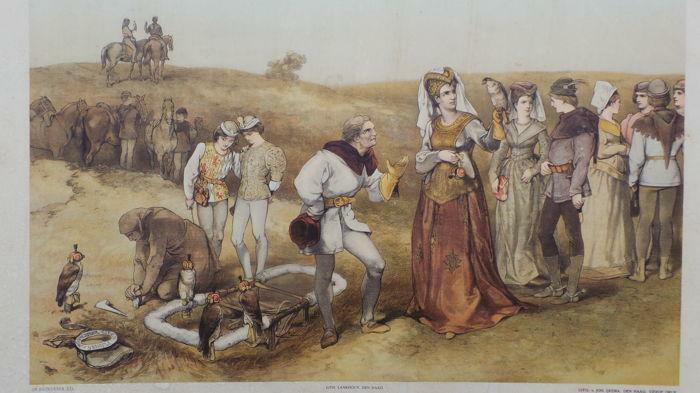 Cult of hunting birds of prey and origin of falconry and hawking and separate its components. 231-232. 1. Contacts of man with hunting birds of prey in nature as a base of origin of their cult. 232-235. 2. Keeping of hunting birds of prey in captivity. 235-244. 3. Two worlds (keeping, training). 244-261. 4. Release into attack. 261-272. 5. Setting of hunting birds at liberty. 272-275. 6. Perch for hunting bird (tuur). 275-281. 7. Shamanism and origin of falconry and hawking. 282-289. Conclusion. 291-294. List of literature. 295-312.